There is only one New York City and only the 2019 TCS New York City Marathon can put you right in the heart of it. 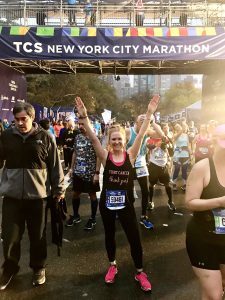 Join the Think Pink Rocks team today and have guaranteed entry into the 2019 TCS New York City Marathon while running for a great cause. 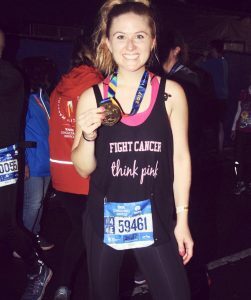 If you already have an entry in the 2019 TCS New York City Marathon but would still like to join and fund-raise for our Think Pink Rocks team, please email our Team Captain. We also intend to have additional sponsorships for future marathons and races as well as to hold other events (walks, concerts, etc.). If you would like us to keep you informed of these future races and events email us your name and e-mail address. Think Pink Rocks Breast Cancer Organization is proud to be a charity partner with the New York Road Runners in the running of the 2019 TCS New York City Marathon! This allows us to provide guaranteed marathon entries to runners who commit to make a donation or raise funds totaling $3,000 or more for Think Pink Rocks. A limited number of entries are available, so sign up now! Why Run For Our Team? Our team will raise money to fund cutting edge breast cancer research. 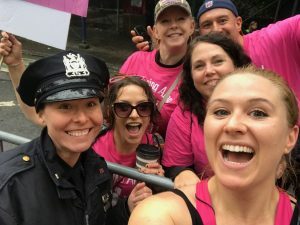 All money raised for Think Pink Rocks from the 2019 TCS New York City Marathon will benefit the dedicated breast cancer research funds that Think Pink Rocks has established at each of Memorial Sloan-Kettering Cancer Center in New York City and the Breast Oncology Center at the University of Michigan Rogel Cancer Center. Some members of our team have a direct connection to breast cancer and have family and friends who have been directly impacted, but we also have many team members who are running or walking simply because they want to support a great cause. Click [Here] to visit the 2019 TCS New York City Marathon web site. The course of the 2019 TCS New York City Marathon will take runners through the heart of NYC, including Central Park. What is My Fundraising Commitment? Each runner commits to raising a minimum of $3,000 for Think Pink Rocks. Applicants are required to provide credit card information as a guarantee. However, your credit card will only be charged for the balance remaining if we have not received donations totaling $3,000 by October 31, 2019. Note that NYRR registration fees are separate and are paid by the individual runners. How Can I Support a Team Participant in this Event? Click here to Sponsor a Team Participant. Thank you in advance for your support! Race entries are limited but are still available so join us today for your guaranteed spot!